FixTunes is a software utillity to organize and fix MP3 music tags and name, in addition to add album art to the song and audio track. FixTunes, as its name implied, can automatically fix any missing or misspelled song details, add album artwork, remove duplicates songs, beside allow users to manage their collection of music. Edit MP3 Song Tags – automatically download song information from an online database so you don’t have to type anything, with manual updating and search database option. FixTunes will read and save both ID3v1 and ID3v2 tags to your MP3 song files – including artist, album, title, track, year genre, comments and album cover art. Album Cover Art – automatically download the album cover art images for your songs from the Internet and add them to your files, for music program such as iTunes to display when playback. FixTunes allows you to browse your music by album cover. Album art is organized by Artist, Genre or Year allowing you to quickly scan your music collection. Rename and Organize Your Music Library – Organize thousands of music files into folders by asking you how you want your files names (for example: “Artist Name – Song Title (Track Number).mp3” and what type of folder structure you want to organize the files into (for example: “Music Folder \ Artist Name \ Album \ file”). FixTunes detect duplicate files and move the duplicate with the lower file size to a special duplicates directory that you can go through at your leisure. Online Catalog Information – In addition to the correct tag data, FixTunes also downloads additional information about your songs and albums from a variety of sources including Google searches, Amazon.com catalog information, artist biographical information from Wikipedia and Amazon.com similar albums lists. Search Your Music from FixTunes. Music Database – FixTunes has a huge music database with information on over 4 million songs, albums and artists. FixTunes uses this database to look up the missing information in your songs (using the existing information) so you don’t have to type it in. With the great help FixTunes provides in organizing music, the price tag of $24.95 looks reasonable. But nothing beats free. Those who intend to purchase can grab the 30% off FixTunes discount code, exclusive for My Digital Life readers. In addition, there are 10 free licenses for FixTunes to giveaway to lucky winners. But before you enter into the giveaway contest, it’s recommended to download and try FixTunes to make sure that it works. The trial version of FixTunes is available for download for free from fixtunes.com. 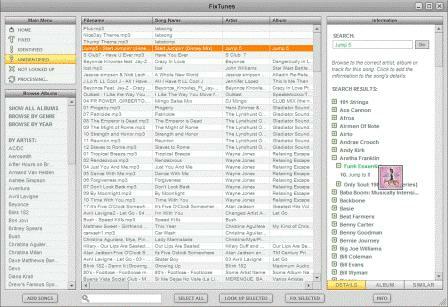 FixTunes supports Mac OS X and Windows operating system. FixTunes for Windows has further 2 variants – iTunes version and non-iTunes version. Currently the FixTunes Windows non-iTunes edition is version 4.82. A new updated version will be released soon, and all winners who get the free license are entitled to the free upgrade too. CONTEST CLOSED. Winners are Abhishek, Scott, Becreative, Renan, michal, Tom, Beau, Guest, Zaheer Sheikh and NiukNiuk. Winners should receive registration information from sponsor soon. To win a copy of FixTunes, simply post a comment with valid email address in the “Mail” text box. To avoid spam, do not type your email address in the comment body. The contest closes on May 3rd, 2009 23:59 server time (based on the date and time stamp on the comment posted). 10 winners of FixTunes full version license will be selected randomly after the contest period ends. The sponsor will email the purchase code to unlock FixTunes for full unrestricted use. The setup installer of FixTunes can be downloaded from fixtunes.com.